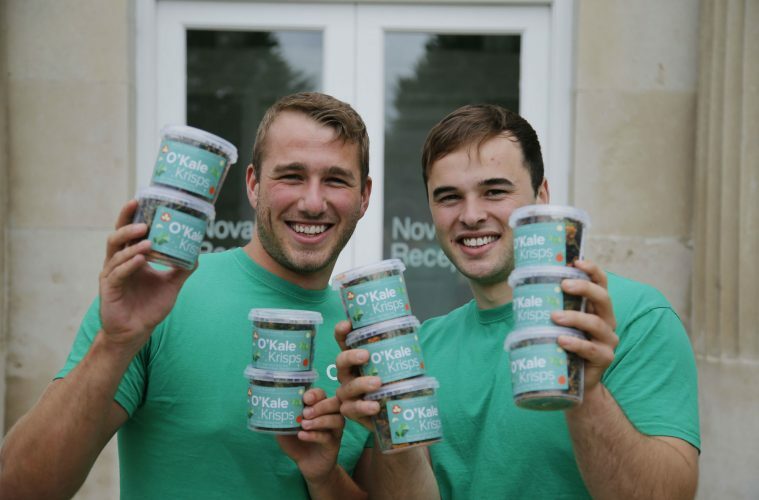 University College Dublin (UCD) has announced O’Kale Krisps as the overall winner of the 2017 UCD Startup Stars Programme. The programme, the University’s start-up support initiative for student entrepreneurs, has now ended at NovaUCD. O’Kale Krisps, an early-stage food venture, has developed low-calorie, highly nutritious and air-dried kale crisps to give consumers a unique and healthy snack alternative when they are on the go. Each tub of O’Kale Krisps contains only 69 calories, is high in iron, calcium, vitamin C, antioxidants and anti-inflammatories. The snacks are currently on sale in three flavours (original, spicy chilli and cheesy) and in 28 stores across Ireland. The members of the O’Kale Krisps team are UCD undergraduate students, Jack Parsons (Business and Law) and Oisin McElhinney (Arts). The UCD Start-up Stars entrepreneurship programme, now in its 3rdyear, has been developed by UCD Research and Innovation, the UCD Innovation Academy and UCD Michael Smurfit Graduate Business School, to support UCD undergraduate and postgraduate students who want to work together to develop and grow start-up companies. The programme began earlier this year with cross-disciplinary workshops and course modules delivered at UCD Michael Smurfit Graduate Business School and the UCD Innovation Academy. During this period students from across the University explored and evaluated a number of real world problems before forming teams to develop start-up solutions to address the identified problems. Five early stage ventures, with a total of 15 team members, were then selected to participate in an intensive mentoring programme which took place over the last 4 weeks at NovaUCD. The aim of this mentoring was to assist the students in refining their start-up ideas through a series of structured workshops, including taught content from industry experts, interactive workshops and regular pitching sessions. In addition, each team also received a cash stipend and office space at NovaUCD. Following final pitches, O’Kale Krisps was selected as the overall winner as it was judged to have the most commercial potential and the founders received a cash prize of €3,000 sponsored by Xilinx. The four runner-ups (profiled below) also received a cash prize of €500 each sponsored by Xilinx. The members of the final UCD Startup Stars Programme judging panel were; Anthony Collins, Senior Staff Marketing Engineer, Xilinx; Barbara Diehl, Executive Director, UCD Innovation Academy; Caroline Gill, Innovation Education Manager, UCD Research and Innovation; Gianni Matera, Founder and Partner, Growing Capital and Dr Sharon O’Kane, NovaUCD, Entrepreneur-in-Residence.